Phlorum’s first time at the Chelsea Flower Show was quite a baptism of fire. The enormity of the show and the sheer volume of punters with a keen interest in plants was really something to behold. Along with several other members of the Property Care Association Invasive Weed Control Group, Phlorum sent staff along to help man the Association’s stand “The Enemy Within”. The purpose of their presence was to raise awareness amongst gardeners and the wider public that invasive non-native species are a real concern that could result in prosecution or substantial impacts on property if not identified and appropriately controlled. Many people were surprised that relatively common garden species such as cotoneaster, Virginia creeper and rhododendron are included in legislation that makes it illegal to allow them to be spread into the wild. 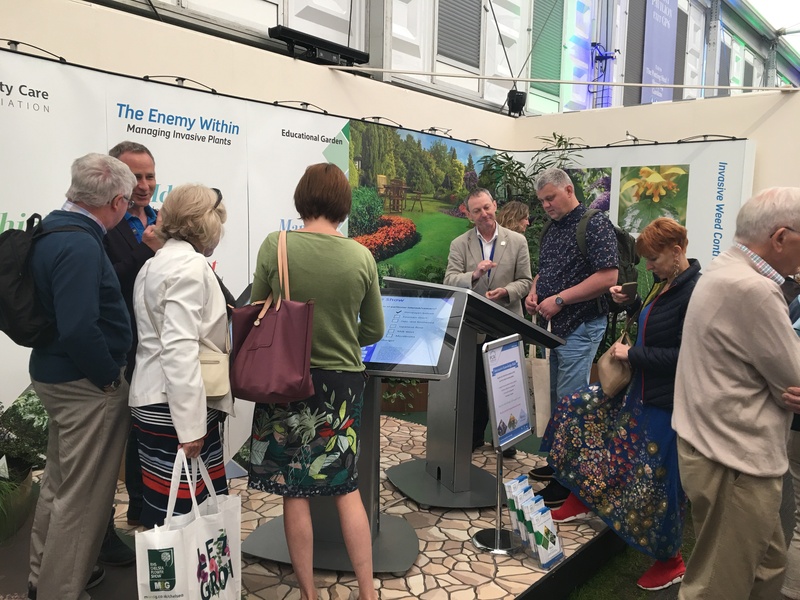 However, awareness of other common garden weeds and invasive plants that quickly grow out of control, such as bindweed, ground elder and bamboo, was much higher amongst visitors to the stand. The PCA was keen that unless there was a legal issue associated with a particular species, the public should not be told what they can and cannot do with their gardens. Rather, the purpose of the PCA’s presence was to provide knowledge to allow gardeners to make informed decisions on what they might choose to plant and manage within their gardens. 4,000 leaflets were handed out and everyone who helped was kept talking to visitors for practically the entire duration of the show each day. In terms of awareness raising, it’s safe to say that this objective was achieved.